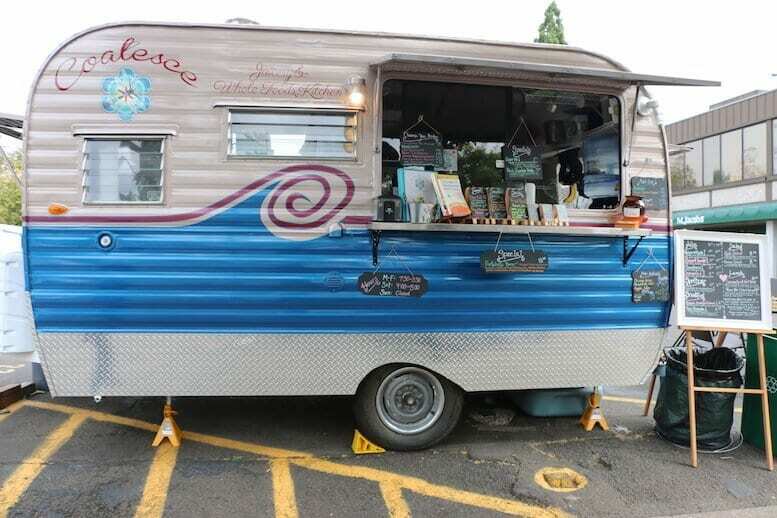 Oregon’s 3rd wave food trucks are on the roll and food with a conscience is on the menu. Organic, local farm to table ingredients, zero waste, and compostable are just a few keys to success for the new generation of food truck owners. Seek out these popular mobile eateries in your travels around this tasty state. For Stephanie Card, a Le Cordon Blue-trained chef, filling a bowl with hearty and healthy ingredients is Heart & Bowl’s staple. After years of cooking in restaurants around the world, she has returned to Southern Oregon, where she was born and raised, to make her long-held dream come true. New in Spring 2018 to the burgeoning Southern Oregon food truck scene, Card puts high priority on sourcing ingredients from local farms and vendors, such as 7 Oaks Farm, Rogue Creamery, Cherry Street Meats, and Rogue Valley farmers markets. The well-seasoned bowls include the Mediterranean Bowl drizzled with Garlic Paprika Tahini, Super Salad Bowl with Quinoa, Open Sesame and the Taco Salad (below). Her mission: Healthy.Local.Seasonal. plays out in every bowl with the customer at heart. 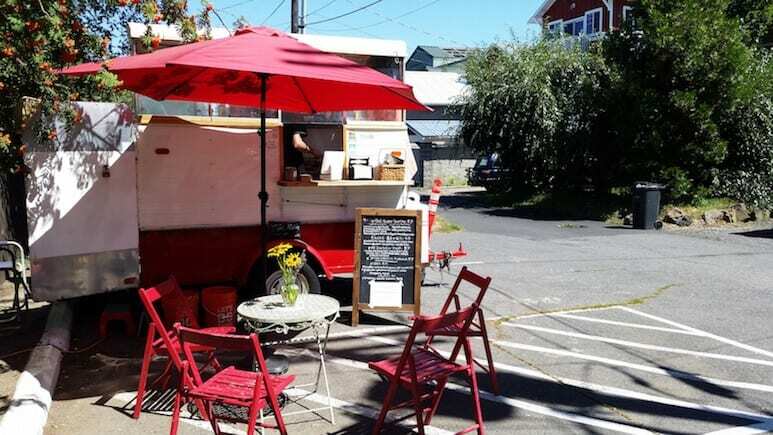 New this year to the food truck line-up at the Medford Growers Market, Two Peas is winning over customers with its zero waste, 100% organic, and plant-based menu philosophy. 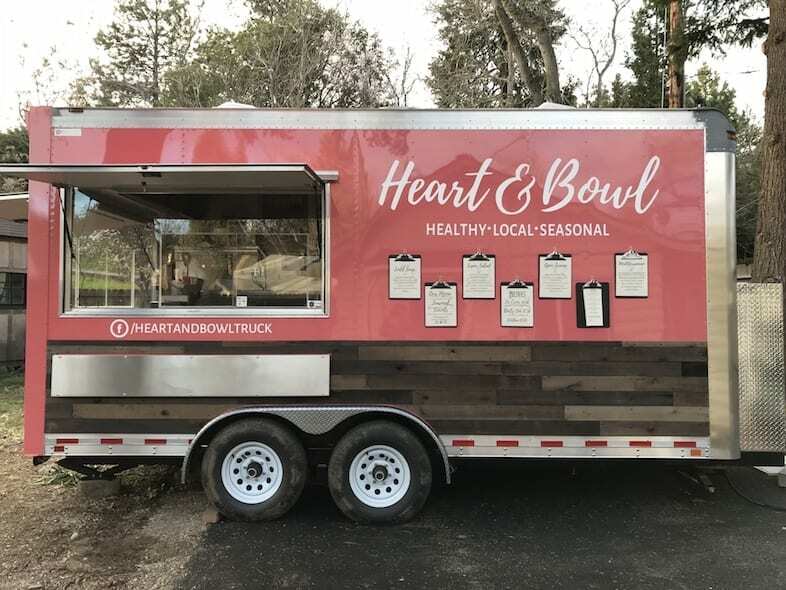 Owner Caroline Francis and her husband, Rowdy Keelor, are serving up international flavors in their Nourish bowls, Falafel Waffles, and other heart-healthy dishes using local ingredients. Hummingbird Wholesale and Fry Family Farm are notable local suppliers. In keeping with their zero waste commitment, Caroline and Rowdy donate leftover meals to members of the homeless community. ♥ twopeasfoodtruck.com for dates and locations. Following a winter hiatus that took owners Andy and Kinzie Whitman to Asia, NorthWest Pine Apple is serving up fresh flavors with their popular bowls and smoothies now in its second year. Loyal fans are lining up again for their favorites and to grab a taste of new tropical-inspired bowls. Pitaya, also known as Dragon Fruit, is a superfruit main ingredient in the Pitaya Bowl and smoothie, paired with coconut, nuts, seasonal fruits and cacao. Bee Love and Date Night are other popular bowls rich in nutrients and tastiness. Smoothies range from tart to sweet with Mango Tumeric, Lemon Ginger Greens, and Blue Lagoon. Watch for the addition of Avocado Toast to the menu this spring. ♥ Facebook page for location updates. This NW Eugene food cart offers more than healthy, made-to-order juice vibes. Lettuce wraps, raw granola, salads, and coconut yogurt also satisfy a crowd of regulars. Owner Karina Wolford’s mission is to educate her customers about the role clean food plays in maintaining a healthy body and lifestyle. Her commitment to serving 100% organic, gluten-free, and soy-free has made Coalesce Juicery the healthiest food truck outside the downtown corridor. Although the menu is comprised of locally-sourced raw vegan ingredients, the seasonal menu includes a few cooked options, such as the Quinoa Breakfast Cereal. The Juicery’s popular Sesame Carrot Nori Wrap holds together the freshness of sesame carrot slaw, avocado, and organic Sriracha. The Green as it Gets juice is a blend of immune-boosting fruits and veggies. For a quick energy boost, consider one of her wheatgrass, turmeric, ginger or garlic shots, solo or added to a juice. ♥ Coalescejuicery.com for the menu. 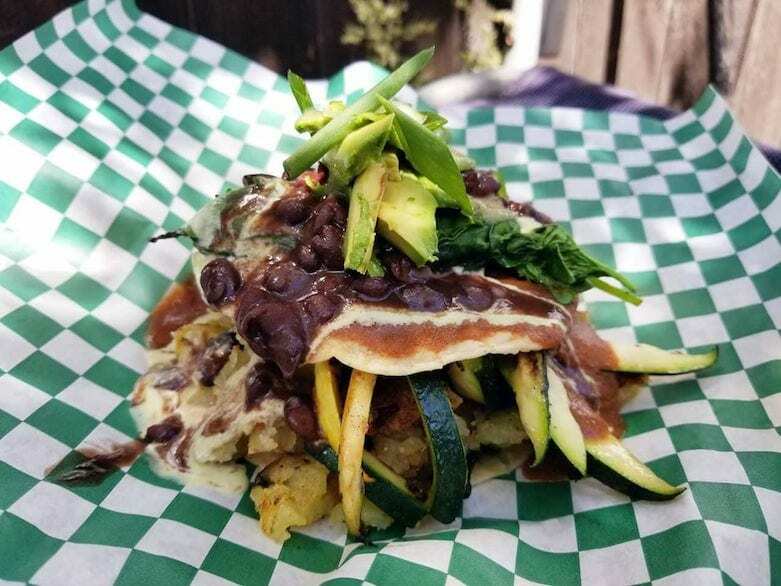 Bend’s #1 vegan food truck, A Broken Angel, has a loyal audience queuing up daily at this mobile kitchen, fashioned from an eight-foot horse trailer. Owner Barb Troyer describes her food style as “New Southern American with a French inspired Pacific NW mountain flair.” Chef Richard Hull is menu master and head cook, translating the unique style into dishes like Grilled Artichoke Tostadas, Mt. Bachelor Hash, and Enchilada Short Stack. Image courtesy A Broken Angel. Not only is this food on wheels, A Broken Angel also offers cooking classes at dinner parties to “empower” your healthy cooking skills. A Kickstarter campaign is underway to raise money for a trailer fit for their growing vegan kitchen. With cooking experience under their belts from stints at Red Hills Market, McMenamins, and Lake Tahoe spots, newly married Kelley & Isaac Mabbitt are taking McMinnville by storm. 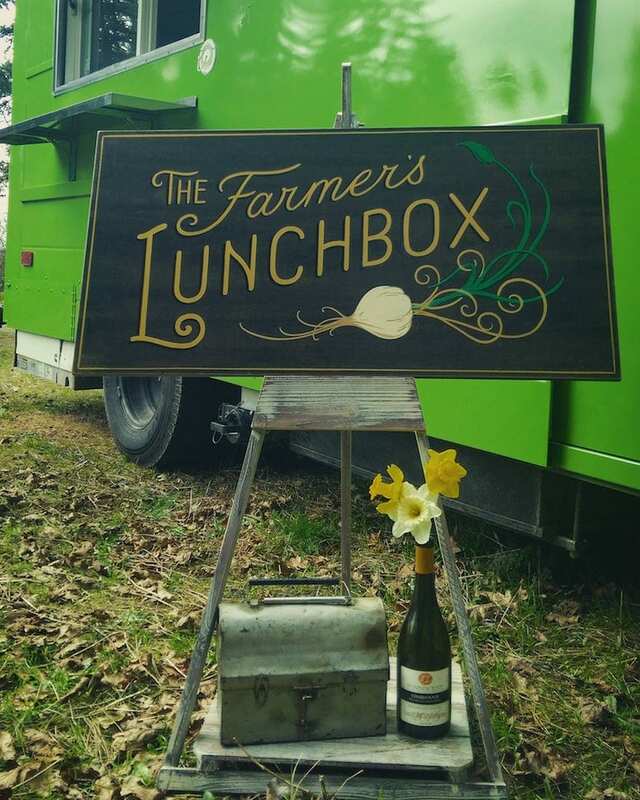 The Farmer’s Lunchbox is serving up a rotating menu of creative veggie and meat sandwiches and sides with ingredients from their 10-acre farm and local producers like Carlton Farms, Portland French Bakery, and Tillamook Cheese. Their housemade basil aioli, chimichurri, tomato jam and onion marmalade add fresh flavor elements, such as in the recent Wine-Braised Brisket with Brie, Mushrooms and Arugula on Ciabatta. Pulled Pork Taco with Housemade Pickled Strawberries. Image courtesy The Farmer’s Lunchbox. The stepvan reno was the culmination of their collective vision to make healthy food options affordable to their community. Ingredients used are either local, quality, and/or organic, no-spray. 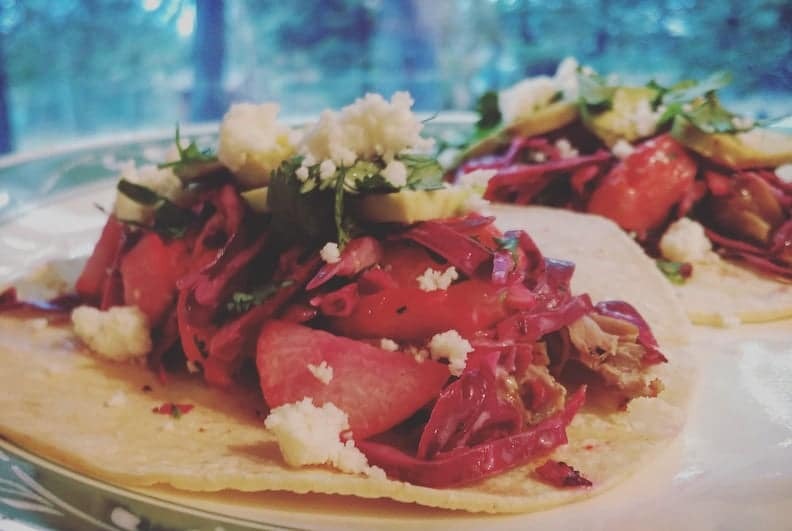 Homegrown fruit will make its way into dishes this summer, similar to their Pulled Pork Taco. To-go ware is compostable and enviro-friendly and they hope to fuel the truck by end of year with bio-diesel converted from their fryer oil. ♥ Facebook page for locations and hours. Fresh Pressed Juices. Image courtesy Sip Juice Cart. 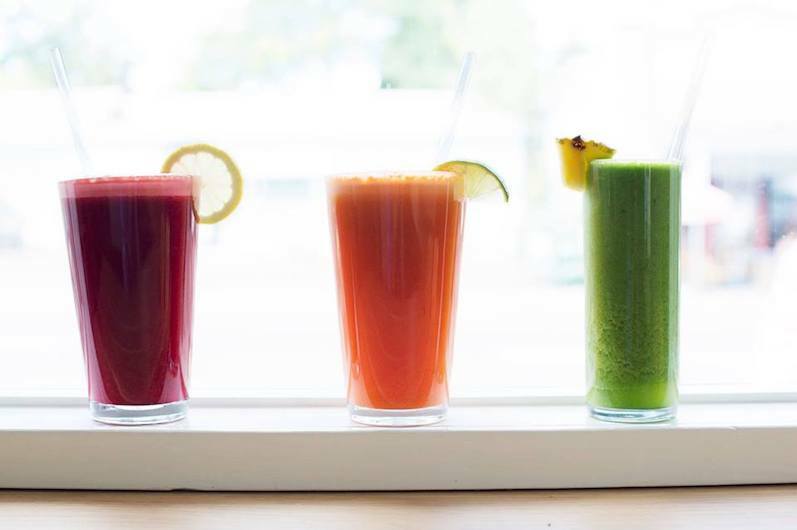 With locations in SE and NE Portland, Sip Juice Cart’s smoothies and fresh-pressed juice combinations have garnered customers year-round. Owner Brian Heck’s local sources include Organically Grown Company and Earthly Gourmet. Watch for Sip juice to show up in cool collaborations around PDX, such as last month’s Sweet Greens juice morphed into Sorbetto at Pinolo Gelato. Super Veggie, Maca Madness, Incredible Hulk are just a few of their healthiest juices and smoothies. 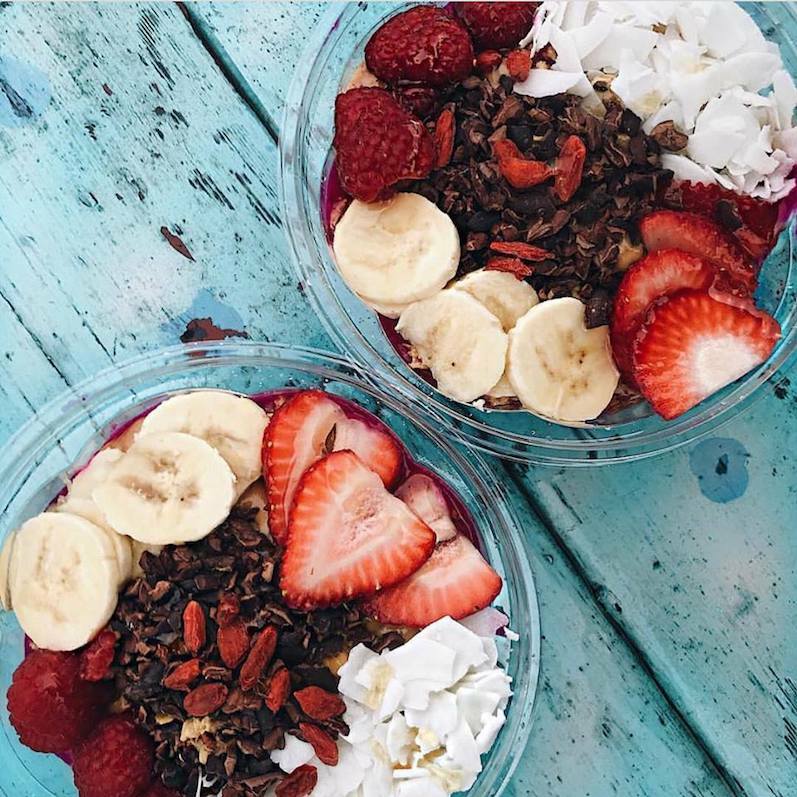 For a heartier nutrition boost, check out the Almond Açaí Bowl and the breakfast-friendly oatmeal bowl. ♥sipjuicecart.com for menu and locations. For those who don’t consider salad a meal, Garden Monsters will change your mind. 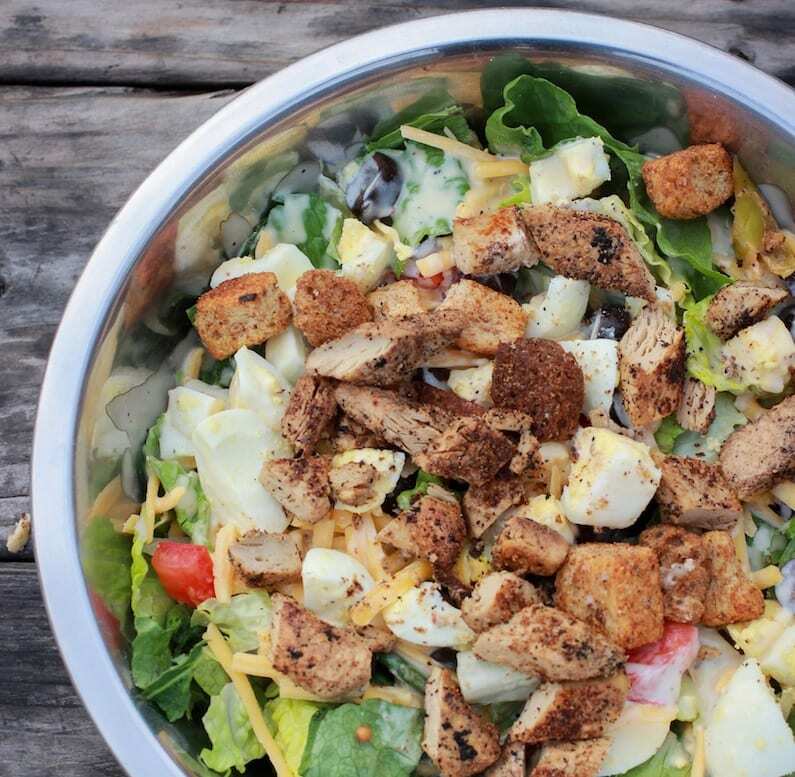 Owner Kyle Hulings is raising the bar on salads. Following years of eating bland salads and a fortuitous work layoff in the tech industry, he persevered through the startup process to launch Portland’s first entree salad “restaurant” in 2013. He uses Oregon raised all-natural meats, GMO-free greens, and all salads can be gluten free and vegan upon request. In keeping with his enviro-friendly operation, all to-go containers and utensils are compostable. To lock in healthy fats for each salad, only organic sunflower oil and olive oil are used in the always handmade dressings, and coconut oils are used for meat grilling. Watch for the May opening of his new to-go restaurant at 4110 N.E. Sandy Boulevard. ♥ gardenmonsters.com for menu and location. These food trucks focus on local ingredients, so be prepared for changing menus during the season.